The gut reaction to the idea of a Praxair/Linde deal is that it will never get past the regulators – based on what happened with Air Products and BOC and given the level of scrutiny and forced divestments around other deals. But they must know this – so they must have a plan! 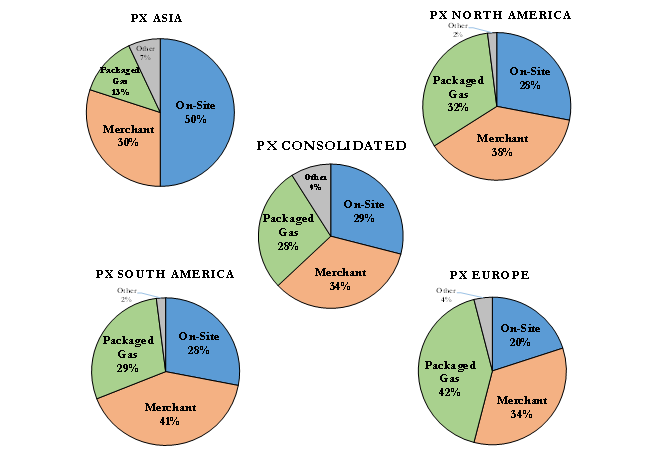 Looking at the business mix – Exhibits 1, 2, and 3 – they could argue that there is only overlap in the merchant and cylinder businesses in the US and depending on geography this might be handled through only limited divestments, with APD an obvious candidate for any packaged gas assets and both APD and Airgas (Air Liquide US) both possibly interested in air separation units. 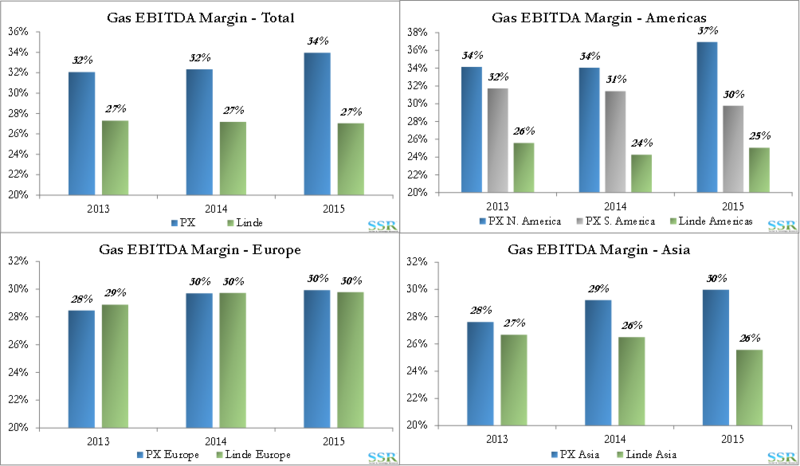 Europe is relatively small for PX, and so again the needed divestment might be limited. Air Products could probably do this deal (with Linde) with fewer US divestments. APD is the smaller North American player with no meaningful healthcare business in the US. If the PX/Linde deal goes through APD becomes a distant 3rd with no real strategy in the US beyond the cost initiatives which are largely played out. Linde is a lot less profitable than PX – Exhibit 4 – and perhaps this is the opportunity. 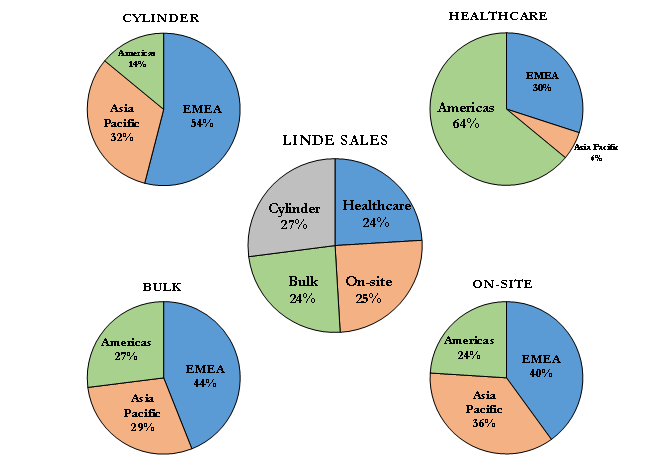 The engineering business at Linde is likely to drag down margins, returns and valuation and consequently we would expect it to be divested – in the same way that PX divested CBI in the 1990’s to become a purer play Industrial Gas company. Some of Linde’s less efficient business will be structural and some a result of its acquisitions, but over time PX should be able to improve margins significantly and this might lead to some quite ambitious ideas around synergies and upside. A 5% improvement in EBITDA margin across the Linde gases business could be worth almost $850 million assuming minimal divestments except the Linde engineering business. This justifies a sizeable premium, should PX decide to acquire Linde rather than find some mechanism that allows for a merger. 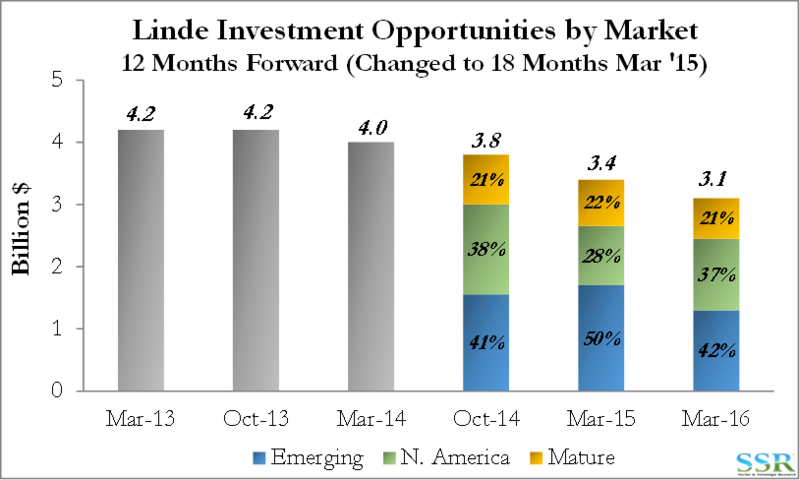 Dwindling backlogs are likely part of the deal rationale – Exhibits 5 and 6 – with fewer investment opportunities as global growth and industrial production remain challenged. Both companies are experiencing the same issue and it is likely that this was one of the drivers behind Air Liquide’s acquisition of Airgas. The industrial gas companies enjoyed a long period (more than 10 years) of consolidation, focus and innovation-lead growth, which lasted from the late 1990s until the financial crisis. Since then the world has seen very slow industrial production growth and even the big, but risky, growth engine in China has slowed. PX, Linde and Air Liquide have had anemic organic growth and have seen returns stand still at best and fall for the most part. A large acquisition like this should give PX the opportunity to grow earnings for a while through efficiency gains, hopefully bridging the gap until we see some better global growth. Stock underperformance is also a major driver of behavior here. 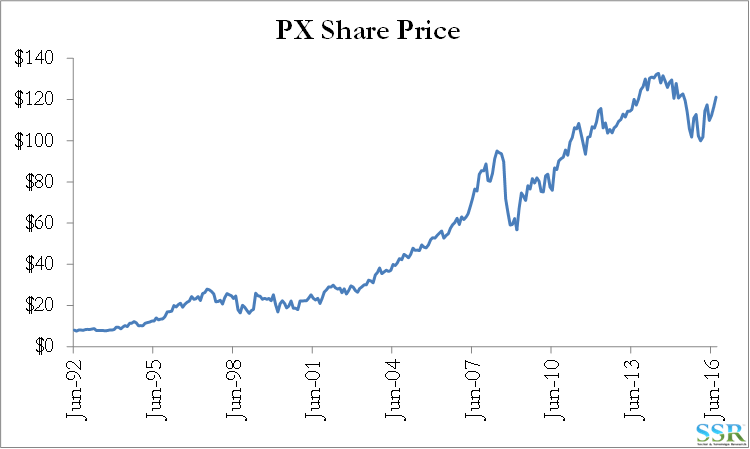 PX has outperformed a little over the last few months as the space is seen as a relative safe haven in times of economic weakness, but the negative trend from 2009 is underperformance – Exhibit 7 – PX not keeping up with the broader market. 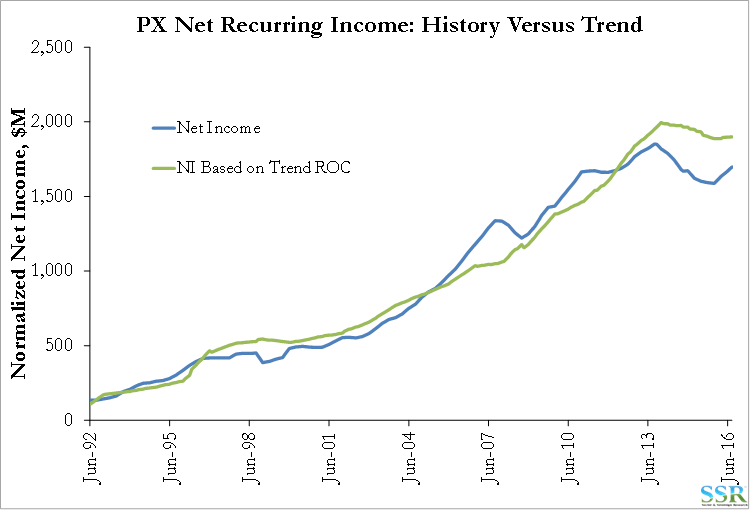 Relative PE is also a sign of investor confidence, which has also slipped. 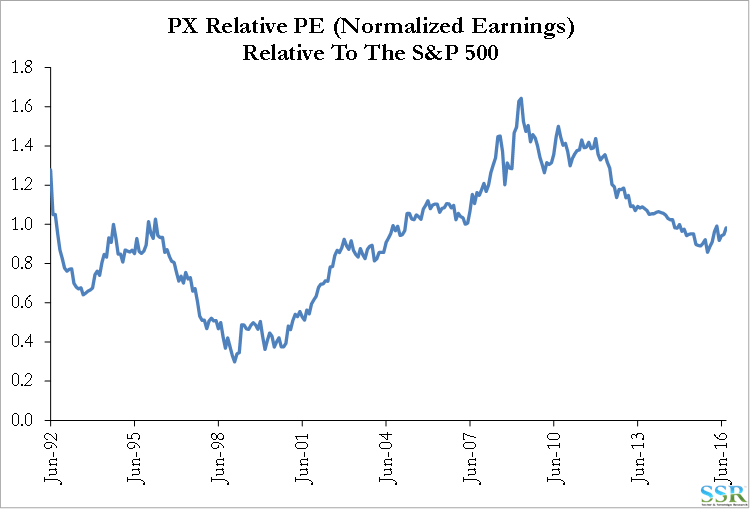 Given the much slower growth that the industry is seeing (Exhibit 9) it could be argued that the relative PE afforded PX today is still anticipating an improvement – earnings growth rates have been below market growth for some time. Furthermore, PX has a management incentive scheme that is stock and option driven – the stock has an average annual appreciation of less than 4.5% since August 2011 (including the gain yesterday) – Exhibit 8. As we showed in our recent report on Coatings, Industrial Gases has been a performance laggard in the broader chemical space for the last 5-6 years. Net income growth has declined and lagged what had historically been predicted by capital deployed – Exhibit 9. This is not a function of capital misallocation for PX, it is a function of much slower economic growth, not keeping pace with customer efficiency gains leading to lower plant operating rates, mainly in the developed world. 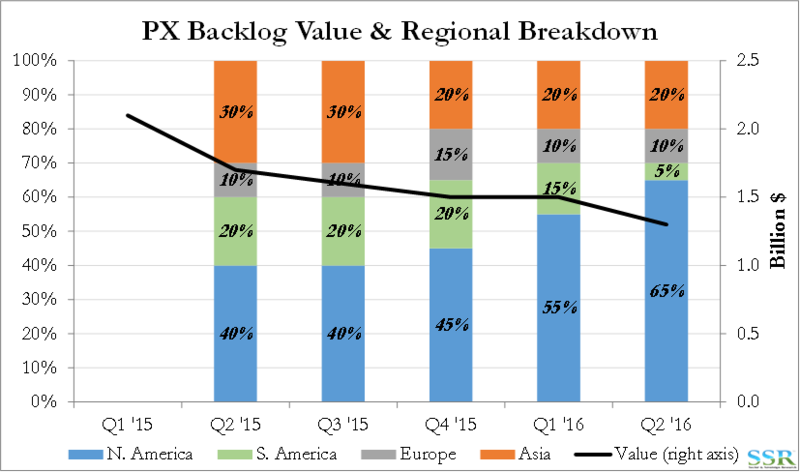 Despite the problems with the currency and the demand levels in Brazil, this remains a high return and very profitable business for PX. Exhibit 10 summarizes key financial and valuation figures. 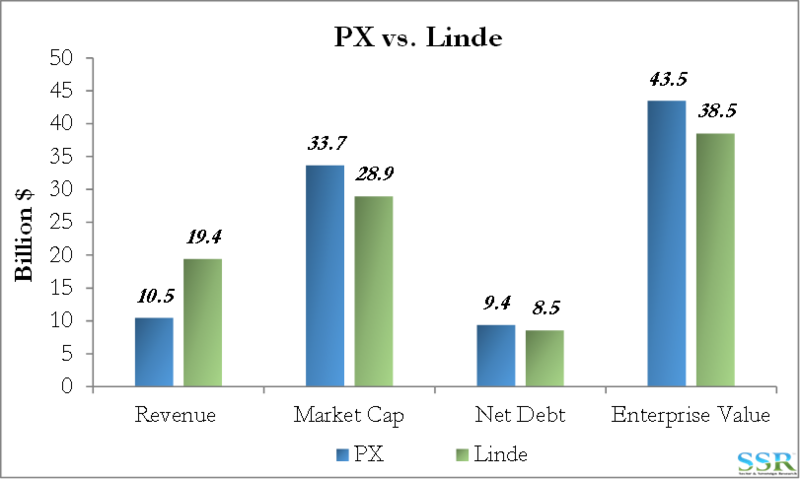 PX and Linde are not dissimilar in terms of enterprise value. While PX would be acquiring a larger sales base than its own, the $2.5 billion Engineering segment would likely be spun out or divested. 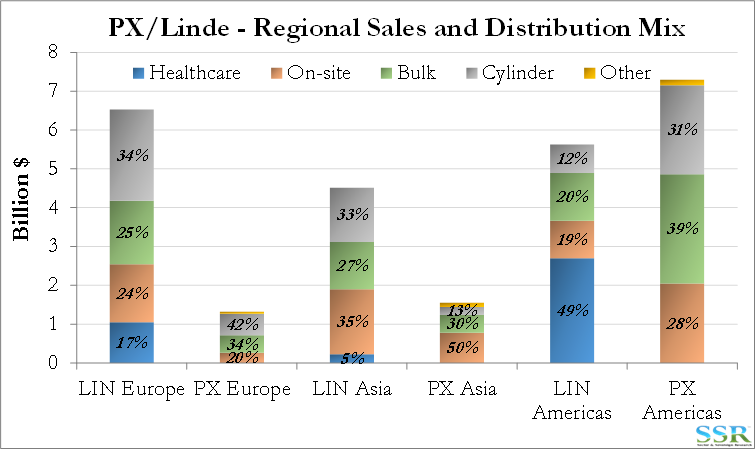 We see PX as more likely to pay up for Linde than the other way around. 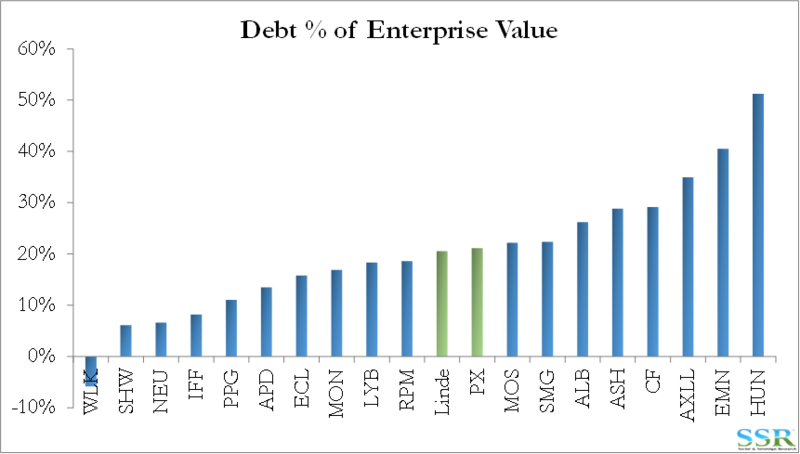 Both companies have a similar debt component of enterprise value – Exhibit 11. We struggle with how a merger of equals would work – PX stock trading 50/50 Europe/US – a major LIN ADR in the US – this would open up exchange rate based arbs almost daily which might impact stock trading. We think it is more likely that PX tries to buy LIN in some way – probably for cash and requiring a major debt increase and an equity raise.